A thorough discussion of Elgg’s data model design and motivation. In Elgg, everything runs on a unified data model based on atomic units of data called entities. Plugins are discouraged from interacting directly with the database, which creates a more stable system and a better user experience because content created by different plugins can be mixed together in consistent ways. With this approach, plugins are faster to develop, and are at the same time much more powerful. Every entity in the system inherits the ElggEntity class. This class controls access permissions, ownership, containment and provides consistent API for accessing and updating entity properties. added by the author of the entity when the entity is created or updated. Examples of metadata include tags, ISBN number or a third-party ID, location, geocoordinates etc. Think of metadata as a simple key-value storage. added by a third party. Such properties include ratings, likes, and votes. These differences might have implications for performance and your business logic, so consider carefully, how you would like to attach data to your entities. In certain cases, it may be benefitial to avoid using metadata and annotations and create new entities instead and attaching them via container_guid or a relationship. ElggEntity is the base class for the Elgg data model and supports a common set of properties and methods. A numeric Globally Unique IDentifier (See GUIDs). An arbitrary subtype (more below). The site that the entity belongs to. A container, used to associate content with a group or a user. Actual entities will be instances of four different subclasses, each having a distinct type property and their own additional properties and methods. object ElggObject Most user-created content, like blog posts, uploads, and bookmarks. Each type has its own extended API. E.g. users can be friends with other users, group can have members, while objects can be liked and commented on. Each entity must define a subtype, which plugins use to further specialize the entity. Elgg makes it easy to query specific for entities of a given subtype(s), as well as assign them special behaviors and views. Subtypes are most commonly given to instances of ElggEntity to denote the kind of content created. E.g. the blog plugin creates objects with subtype "blog". By default, users, groups and sites have the the subtypes of user, group and site respectively. Plugins can use custom entity classes that extend the base type class. To do so, they need to register their class at runtime (e.g. in the 'init','system' handler), using elgg_set_entity_class(). For example, the blog plugin could use elgg_set_entity_class('object', 'blog', \ElggBlog::class). Plugins can use elgg-plugin.php to define entity class via shortcut entities parameter. Before an entity’s save() method is called, the subtype must be set by writing a string to the subtype property. Subtype cannot be changed after saving. A GUID is an integer that uniquely identifies every entity in an Elgg installation (a Globally Unique IDentifier). It’s assigned automatically when the entity is first saved and can never be changed. Some Elgg API functions work with GUIDs instead of ElggEntity objects. The ElggObject entity type represents arbitrary content within an Elgg install; things like blog posts, uploaded files, etc. Most other data about the object is generally stored via metadata. The ElggUser entity type represents users within an Elgg install. These will be set to disabled until their accounts have been activated (unless they were created from within the admin panel). language Their default language code. code Their session code (moved to a separate table in 1.9). The ElggSite entity type represents your Elgg installation (via your site URL). The ElggGroup entity type represents an association of Elgg users. Users can join, leave, and post content to groups. ElggGroup has addition methods to manage content and membership. Not to be confused with the entity type ElggGroup, Elgg comes with a plugin called “Groups” that provides a default UI/UX for site users to interact with groups. Each group is given a discussion forum and a profile page linking users to content within the group. You can alter the user experience via the traditional means of extending plugins or completely replace the Groups plugin with your own. By passing along the group as container_guid via a hidden input field, you can use a single form and action to add both user and group content. Use ElggEntity->canWriteToContainer() to determine whether or not the current user has the right to add content to a group. In fact, [[Engine/DataModel/Entities/ElggGroup|ElggGroup]] simulates most of the methods of [[Engine/DataModel/Entities/ElggUser|ElggUser]]. You can grab the icon, name etc using the same calls, and if you ask for a group’s friends, you’ll get its members. This has been designed specifically for you to alternate between groups and users in your code easily. Entities have a owner_guid GUID property, which defines its owner. Typically this refers to the GUID of a user, although sites and users themselves often have no owner (a value of 0). The ownership of an entity dictates, in part, whether or not you can access or edit that entity. In order to easily search content by group or by user, content is generally set to be “contained” by either the user who posted it, or the group to which the user posted. This means the new object’s container_guid property will be set to the GUID of the current ElggUser or the target ElggGroup. E.g., three blog posts may be owned by different authors, but all be contained by the group they were posted to. Note: This is not always true. Comment entities are contained by the object commented upon, and in some 3rd party plugins the container may be used to model a parent-child relationship between entities (e.g. a “folder” object containing a file object). Annotations are pieces of data attached to an entity that allow users to leave ratings, or other relevant feedback. A poll plugin might register votes as annotations. Annotations are stored as instances of the ElggAnnotation class. Like metadata, values are stored as strings unless the value given is a PHP integer (is_int($value) is true), or unless the $vartype is manually specified as integer. Metadata in Elgg allows you to store extra data on an entity beyond the built-in fields that entity supports. For example, ElggObjects only support the basic entity fields plus title and description, but you might want to include tags or an ISBN number. Similarly, you might want users to be able to save a date of birth. Like annotations, values are stored as strings unless the value given is a PHP integer (is_int($value) is true), or unless the $value_type is manually specified as integer (see below). As of Elgg 3.0, metadata no longer have access_id. This is suitable for most purposes. Be careful to note which attributes are metadata and which are built in to the entity type that you are working with. You do not need to save an entity after adding or updating metadata. You do need to save an entity if you have changed one of its built in attributes. As an example, if you changed the access id of an ElggObject, you need to save it or the change isn’t pushed to the database. As of Elgg 3.0, metadata’s access_id property is ignored. Note that this will return the absolute value of the metadata. To get metadata as an ElggMetadata object, you will need to use the methods described in the finer control section below. If you stored multiple values in this piece of metadata (as in the “tags” example above), you will get an array of all those values back. If you stored only one value, you will get a string or integer back. Storing an array with only one value will return a string back to you. E.g. Note that you cannot “append” values to metadata arrays as if they were normal php arrays. For example, the following will not do what it looks like it should do. Though there are some cases to store entity GUIDs in metadata, Relationships are a much better construct for relating entities to each other. Relationships allow you to bind entities together. Examples: an artist has fans, a user is a member of an organization, etc. Each relationship has direction. Imagine an archer shoots an arrow at a target; The arrow moves in one direction, binding the subject (the archer) to the target. A relationship does not imply reciprocity. A follows B does not imply that B follows A.
Relationships_ do not have access control. They’re never hidden from view and can be edited with code at any privilege level, with the caveat that the entities in a relationship may be invisible due to access control! This triggers the event [create, relationship], passing in the created ElggRelationship object. If a handler returns false, the relationship will not be created and $success will be false. This triggers the event [delete, relationship], passing in the associated ElggRelationship object. If a handler returns false, the relationship will remain, and $was_removed will be false. E.g. retrieving users who joined your group in January 2014. Granular access controls are one of the fundamental design principles in Elgg, and a feature that has been at the centre of the system throughout its development. The idea is simple: a user should have full control over who sees an item of data he or she creates. In order to achieve this, every entity and annotation contains an access_id property, which in turn corresponds to one of the pre-defined access controls or an entry in the access_collections database table. ACCESS_LOGGED_IN (value: 1) Logged in users. ACCESS_PUBLIC (value: 2) Public data. You may define additional access groups and assign them to an entity, or annotation. A number of functions have been defined to assist you; see the Access Control Lists for more information. All data retrieval functions above the database layer - for example elgg_get_entities will only return items that the current user has access to see. It is not possible to retrieve items that the current user does not have access to. This makes it very hard to create a security hole for retrieval. You can override this behaviour using a plugin hook called permissions_check, which passes the entity in question to any function that has announced it wants to be referenced. Returning true will allow write access; returning false will deny it. See the plugin hook reference for permissions_check for more details. This is a description of the main tables. Keep in mind that in a given Elgg installation, the tables will have a prefix (typically “elgg_”). 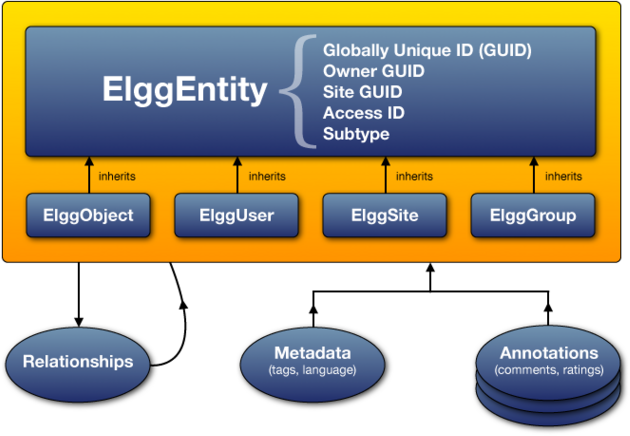 This is the main Entities table containing Elgg users, sites, objects and groups. When you first install Elgg this is automatically populated with your first site. This table contains Metadata, extra information attached to an entity. This table contains Annotations, this is distinct from Metadata. time_created Unix timestamp of when the annotation is created. This table defines Relationships, these link one entity with another. guid_one The GUID of the subject entity. relationship The type of the relationship. guid_two The GUID of the target entity. This table defines Access Collections, which grant users access to Entities or Annotations.